Soft, tender and moist sandwich bread with just a hint of coconut flavor. In a 2-cup microwave-safe glass measuring cup or small bowl, heat the coconut milk until it just begins to boil; about 2 minutes. Add oatmeal to the milk and stir to combine. Set aside and let cool until temperature reaches 120 to 130°F, about 15 minutes. Stir in ¼ cup tap water (120-130°F). To the bowl of a stand mixer fitted with the dough hook (or a large mixing bowl and knead by hand for about 10 minutes), combine flour, oil, brown sugar, instant dry yeast, and oatmeal mixture. Knead for 5 to 7 minutes on low speed, or until a moist, shaggy dough forms. The dough is quite moist and sticky, but resist the temptation to add additional flour, unless it's so moist that it won't combine. Conversely, if it's too dry, add up to one-quarter cup water. Erring on the side of too moist is always preferable to too dry in bread-making. After kneading, turn the dough out into a large, greased bowl, cover with plastic wrap, and let it rise in a warm, draft-free place for about 2 hours, or until doubled in size. Spray an 8-by-4-inch loaf pan with (coconut) cooking spray, or grease and flour the pan; set aside. With your fingers or a rolling pin, shape dough into a 10-inch by 6-inch rectangle, just eyeball it. The long side should be slightly longer than the baking pan, which is 8 inches. Starting with a long edge, roll to form a tight cylinder. There's not much to roll, about 3 turns. Tuck ends in and under, and place cylinder in prepared pan, seam side down. Optionally, when rolling, sprinkle with cinnamon, nutmeg, ground ginger, raisins, or diced dried fruit. Cover pan with plastic wrap, and allow dough to rise in a warm, draft-free place until doubled, about 60 to 75 minutes. Preheat oven to 350°F. Bake for about 30 minutes, or until lightly golden, domed, and puffy. Rotate pan midway through baking if desired. When tapped, bread should sound hollow. The internal temperature should reach 210°F. 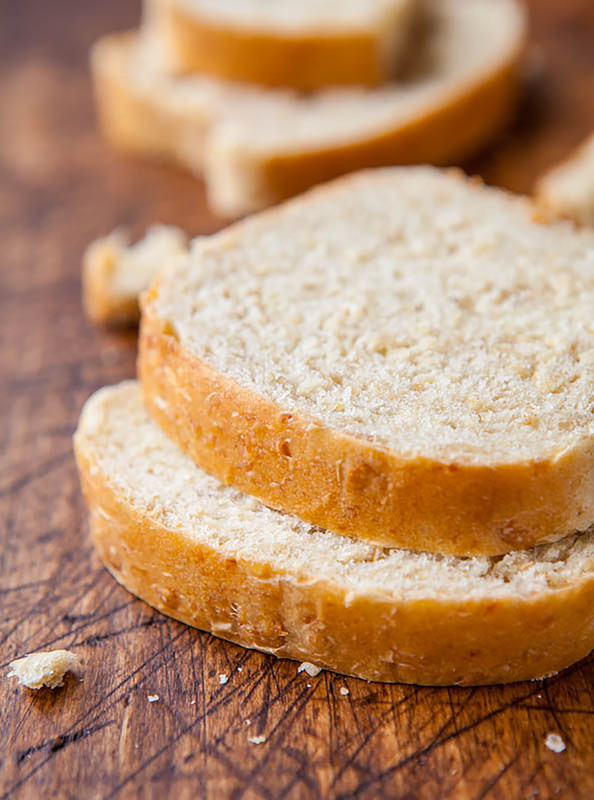 Allow bread to cool in pan for 5 to 10 minutes before turning out onto a wire rack to cool completely before slicing. I have made this bread twice, once with AP flour and once with Gluten Free AP substitute flour. Worked like a charm both times. Such a great recipe for a delicious bread for anyone! How would this recipe do made into dinner rolls? Cinnamon rolls? Look forward to giving this a try. You can use this dough to make dinner rolls or even cinnamon rolls. The rise and bake times will need to be adjusted, so just keep an eye on the dough. I am excited to find a recipe for friends who v are lactose intolerant. Just made this and it’s delicious. Hi Gabriella – I’m so glad you enjoyed the bread! Yes, you can double the recipe.